American's power tool and hand tool boxes come in a variety of standard sizes. American Metal Crafters currently offers a variety of standard box sizes for all of your power tool and hand tool storage and transfer needs. We design and manufacture metal cases for several nationally-recognized tool companies. American's custom manufacturing services are especially useful in tool box design. Foam inserts can be die cut to give a snug fit to any tool, and metal brackets and dividers help ensure that tools are held securely in place. Any box can be customized with color powder spray coating, silk screening and decal application. 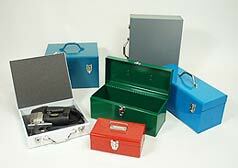 See our Custom Metal Boxes & Cases page for more details on custom applications. Tool boxes can also be customized with die-cut foam inserts to provide a tight fit. Call our Sales Department today at (860) 343-1960, or toll-free at 1-800-840-9243, to discuss your power tool and hand tool box needs, or fill out our online form to receive more information.